Citrus fruits abound during the winter months, so let’s enjoy these seasonal beauties! Wondering what to do with a box of oranges from your church or the local high school marching band? I’m a big fan of orange-flavored sweets and baked goods, so there are many recipes in my arsenal that utilize oranges! Some of my favorites (that will definitely be included on the blog soon) include cranberry-orange-pecan biscotti, “Aunt Sally’s” orange cookies (an essential holiday cookie in our family), orange scones, and orange marmalade! There is nothing better than this sweet and slightly tangy goodness to slather on a hot, flaky croissant or a fresh slice of our honey wheat bread! Now that we are all craving a spoonful or two of this delectable spread, what variety of orange should we use? I have tried different kinds of oranges, each with varying success. Typically, I prefer the ones with thinner skin, and for this recipe, I used Florida Hamlin juice oranges. Their thin skin helps to minimize the amount of bitter, white pulp that ends up in our finished product. In this particular batch, I used the entire orange to maximize the flavor from the rind’s essential oils. 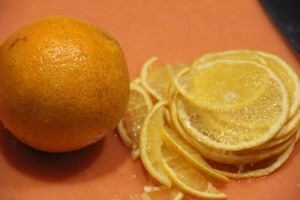 With some thick skin oranges, I find it necessary to peel the orange to eliminate the thick, inner white pulp. 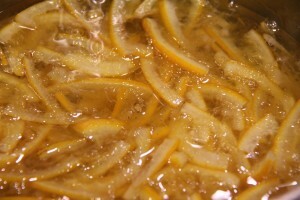 While this method may sacrifice some flavor that lies within the orange, we end up with a clearer, bitter-free marmalade. When it comes to storing the marmalade, you have a couple of options. 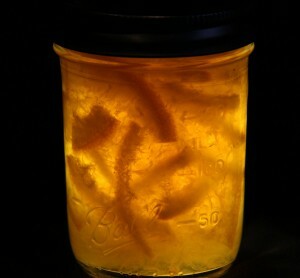 If you’d like it to have a long shelf life (up to 6 months), you can “hot can” the orange marmalade, as we show below. Of, if you plan to consume the marmalade in the next few weeks, you can simply place it into clean jars, refrigerate, and use like any opened jar of jam. The canning process consists of a few steps – pouring the finished product into sterilized jars, positioning the canning lids and rings onto the jars, and boiling the filled jars in water for about 10 minutes. Let’s talk about the boiling process (science time! ), which is a double-desirable step in our canning journey. First and foremost, it raises the temperature of the jars, lids, and air inside the jar to 200 F. The heat kills all of the pesky germs that would cause our marmalade to spoil. Secondly, as the boiling water heats the air and liquid in the jar, it causes the air to escape up through a special gasket on the canning jars. Cool! As the marmalade cools (see, it is cool! ), a vacuum forms inside the jar, pulling the lid inward nice and tight. 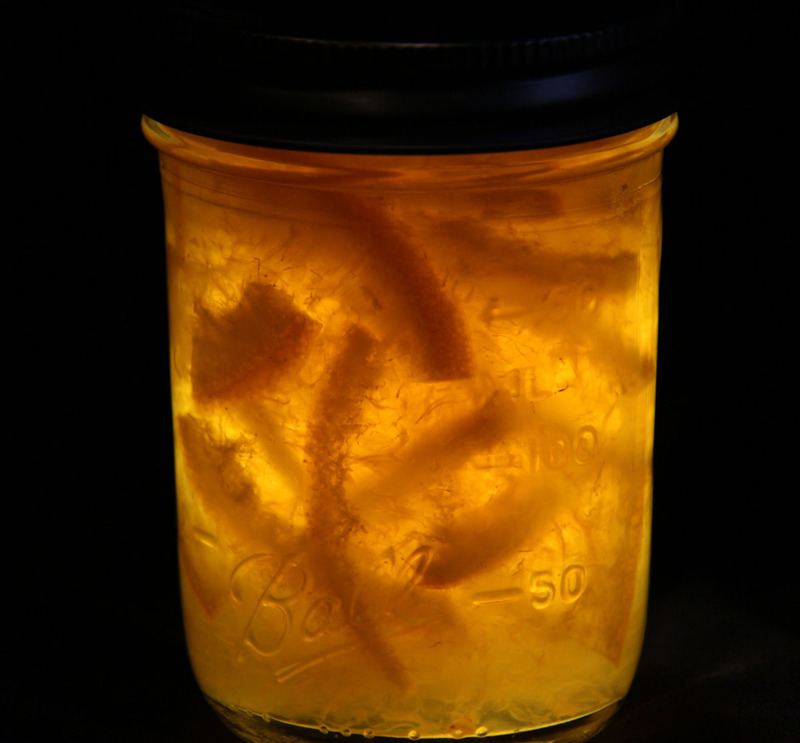 You’ve just created marmalade that will keep on your shelf for about six months! This sweet spread also makes the perfect housewarming gift or homemade birthday present. Add a ribbon and label to complete a special present that your friends and family are sure to love! Stat by washing the oranges under water. 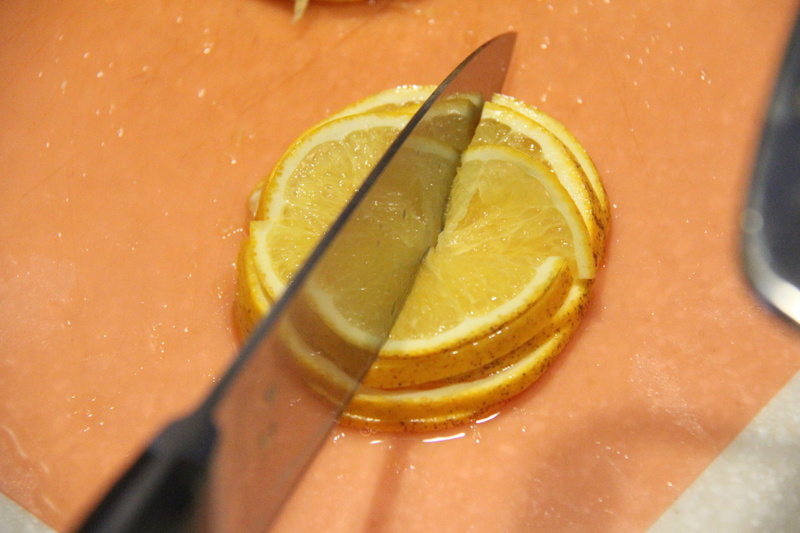 Then, slice the oranges with a sharp knife or a mandolin to about 1/10″ thick slices. Make sure you remove the seeds. Cut each slice into quarters, and place the orange pieces into a deep 6 quart pot. 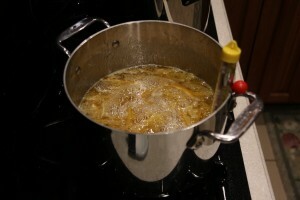 Add 6 cups of water and cook at a gentle boil for about 50 minutes, stirring occasionally. While the oranges are cooking, prepare your canning pot by filling a second large pot with water, leaving enough room for the jars so the water does not overflow when they are added. This pot should be large enough to hold 8 to 10 canning jars with about 1 inch of water above the tops of the jars. 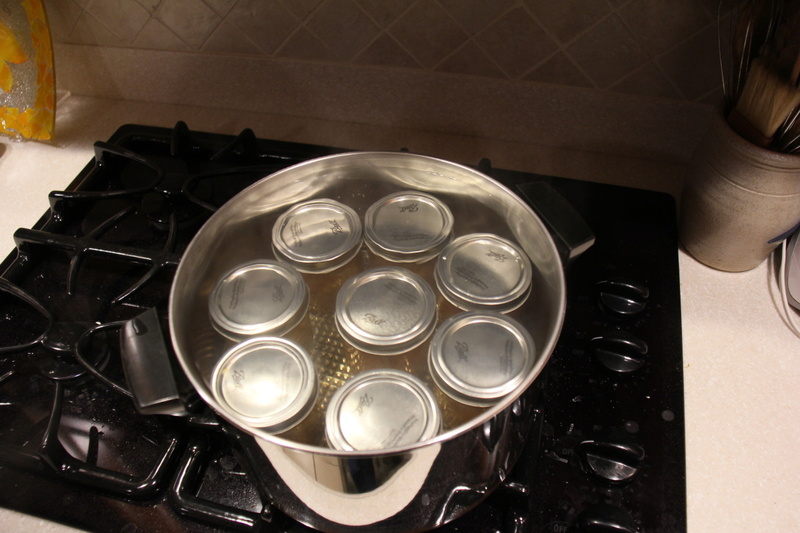 Place a small rack or even a piece of cloth at the bottom of the pot so the jars don’t come into direct contact with the bottom of the pot while canning. To sterilize the jars, place the clean, open jars (no lids) into the water along with a ladle and funnel that you’ll be using to fill the jars. Boil the jars for about 10 minutes. Turn off the heat and add the lids. Let sit until your ready to can. About 15 minutes or so before the marmalade is done cooking, use your canning tongs to remove the jars and lids from the canning pot and place them upside down on a clean dish towel. Turn the heat back on the canning pot so that the water is boiling when the marmalade is ready. 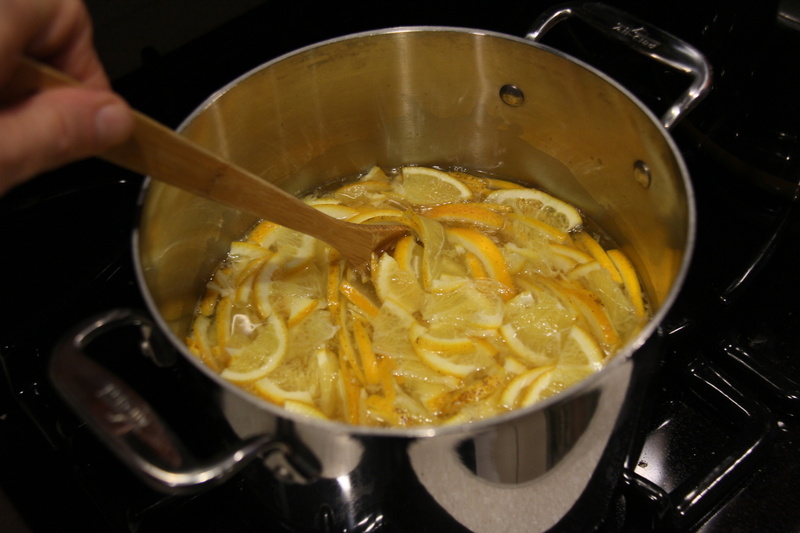 Once the marmalade reaches 223F, remove the pot from the heat. 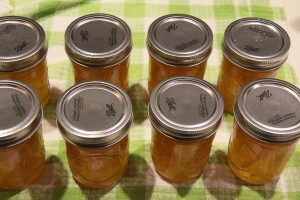 Fill each of the canning jars with the marmalade to about 1/4″ from the top. 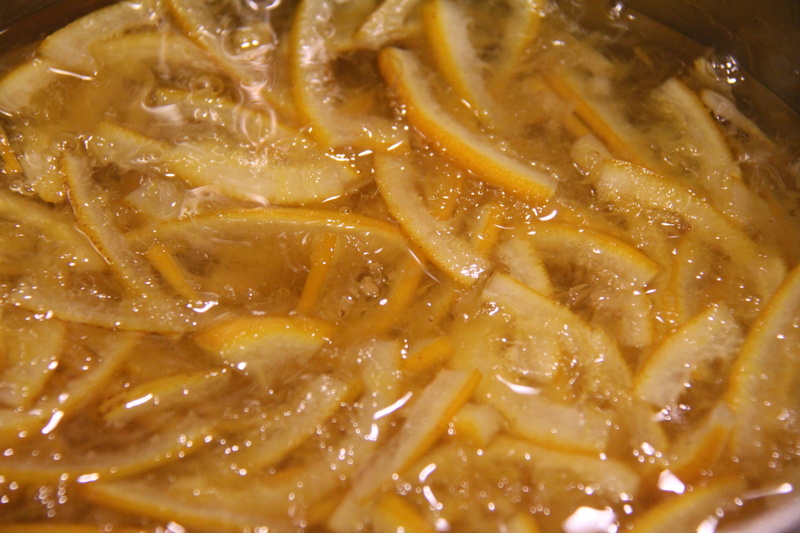 Wipe the top edge of the jar with a damp paper towel to remove any marmalade that may have dripped. Place the lid on the jar (gasket side down) and screw on the band – medium tight. Omg, your orange marmalade is THE BEST! Can I trade you something for a jar? Like maybe some gardening help in the spring (or maybe after the wedding, in the summer)?